There are no rooms available at The Granary for these dates. Parking: On street parking is available and is free of charge. Parking is available nearby and is free of charge. Groups: Groups are accepted up to a maximum of 4 people. Stag and hen groups are allowed. Beautiful, peaceful location close to local activities. 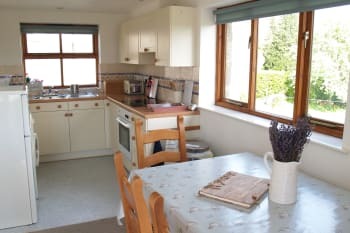 Cottage is comfortable and warm, and includes all those little extras to make the stay more comfortable. As well as a lovely welcome treat of cake and apple juice. The family cycle trail in the Forest of Dean was perfect for our 12 and 9 year old. Parking at Cannop Ponds just after the main cycle centre is free and has a small mobile caterer selling hot/cold drinks and bacon butties etc. 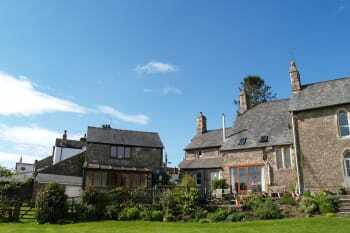 Beautifully presented accomodation with great views and very well equipped. Little touches like having tea, coffee and milk make a difference too. St Briavels makes a good hub for exploring the Wye Valley with lots to see both up and down river. If you don't want to cook there are lovely pubs all around but the best we found was nearby at Brockweir. Probably the best cottage we've ever stayed at. Lovely, clean and well sized for a family of four. 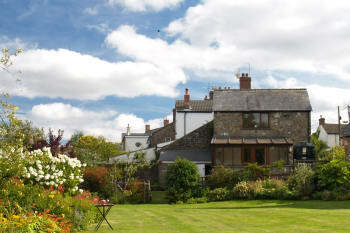 Perfectly situated to explore the beautiful Wye Valley and Forest of Dean. A larger pan for cooking is all that could have made it better for us. Lovely cottage in a fantastic location, ideally placed to explore the Wye Valley and beyond. The extra touches provided by Lucy and Andy, such as supplying kitchen and bathroom essentials, made this a home away from home. The Pantry is a very handy deli/convenience store in the village. Take some of their foggies for a picnic if you go canoeing. Also recommend the very locally produced white chocolate orange ice cream they sell. We felt our canoe experience and views from Symonds Yat was equal to the Dordogne. Saracens Head Inn there has a good menu and nice atmosphere. Clearwell caves and Goodrich Castle also worth a trip. Very enjoyable stay in top class accommodation!! Symonds Yat and Puzzlewood is a must see!! Great place to stay, very clean and comfortable. Location is also good for exploring the forest and attractions. We enjoyed our stay with you and would love to return another time. 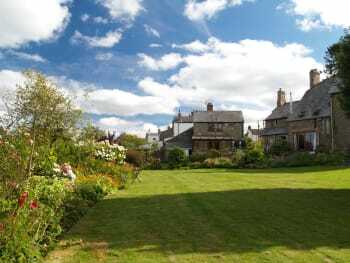 The location is perfect for exploring the surrounding area. The accommodation was lovely and suited our requirements perfectly. It would be nice to return again during warmer weather so we could enjoy the conservatory in the evenings. We would recommend the George Pub across the road. Lovely food, beer and staff. We visited Chepstow, Tintern Abbey, Symmonds Yat and several other places. Enjoyed several walks along the river. The caves at Clearwell were very interesting and you can also do deep cave trips during the summer. We have a list of things we need to do at our next visit, the 365 steps and the Devils Pulpit etc. 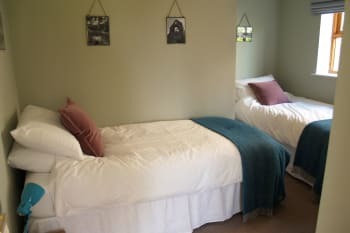 Very comfortable and well equipped self catering accommodation. Sleepy village with all you need: pub, pantry, C12th Castle and church! Peace and quiet yet close to lots of places of interest. Lucy is very welcoming, with cakes, wine, local apple juice and her own hen's eggs all ready for us on arrival! The George Inn across the road has a varied menu. The Pantry (local Deli) has lots of tasty provisions. Puzzlewood, Tintern Abbey, Chepstow Castle all worth a visit. The Granary felt like a home from home. 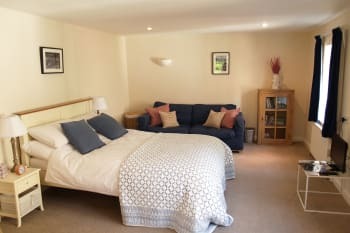 Comfortable, relaxing and in a quiet and peaceful location. Everything we needed and more was provided, including delicious lemon cake and organic juice! 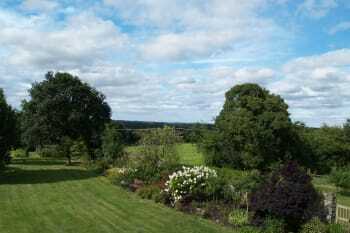 The views from the upstairs kitchen/diner were beautiful, inviting you to walk and explore the area. 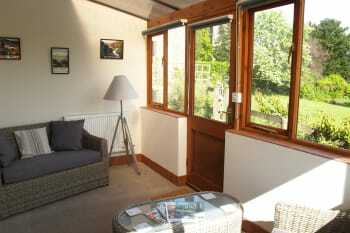 The downstairs conservatory was perfect, soaking up the sunshine...the ideal place to sit and read or watch TV. Lovely little garden with outdoor seating too. Faultless, we are planning a return trip! Thank you Lucy. Impressive C12th castle and church literally around the corner. Lovely meals had at The George pub across the road. The Pantry shop sold delicious Deli type foods. Lovely park for younger children. Nice walks in the village itself. Further afield, would recommend Puzzlewood, Beechenhurst sculpture trail, afternoon tea at The Speech House, Chepstow and Raglan castles and Symonds Yat. Stock up on food for your stay in Monmouth at Waitrose & M&S! 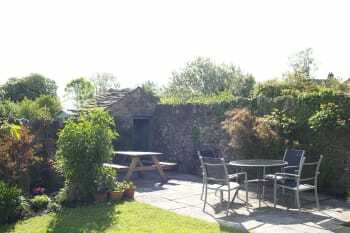 A lovely clean and well equipped cottage in beautiful surroundings. 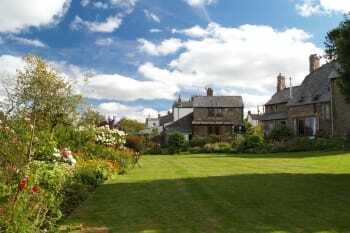 St. Briavels is a lovely village and from the cottage you get wonderful views over the surrounding countryside. The George is the village pub and serves very tasty food in a pleasant and welcoming atmosphere.